My art is both varied in my choices of subject and the range of mediums I use. I always enjoy the opportunity to paint and draw new subjects. The mediums I use mainly are pencil, pen & ink and watercolours. The unique luminosity of watercolours never ceases to inspire me, as they change during the drying period. Accidents often work out for the best in some paintings! 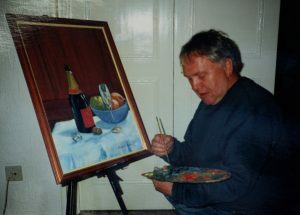 In my early paintings I began using oils and acrylics, but I now find working in watercolours gives me greater freedom and creativity, which I find more enjoyable and often more challenging. I welcome your comments on my work and I am always happy to discuss my paintings with you. Should you feel you would like to purchase any of the works from my Gallery link, I would be delighted! I have tried to keep the prices reasonable and affordable and will discuss any commissions required. I particularly enjoy working on commissions for houses, people, pets, landscapes and portraits. I can work from life or photographs to meet a client’s demands and I always enjoy unusual or testing projects. Please enjoy my Gallery collection. I look forward to hearing from you – especially if you’re interested in purchasing an original piece of artwork.